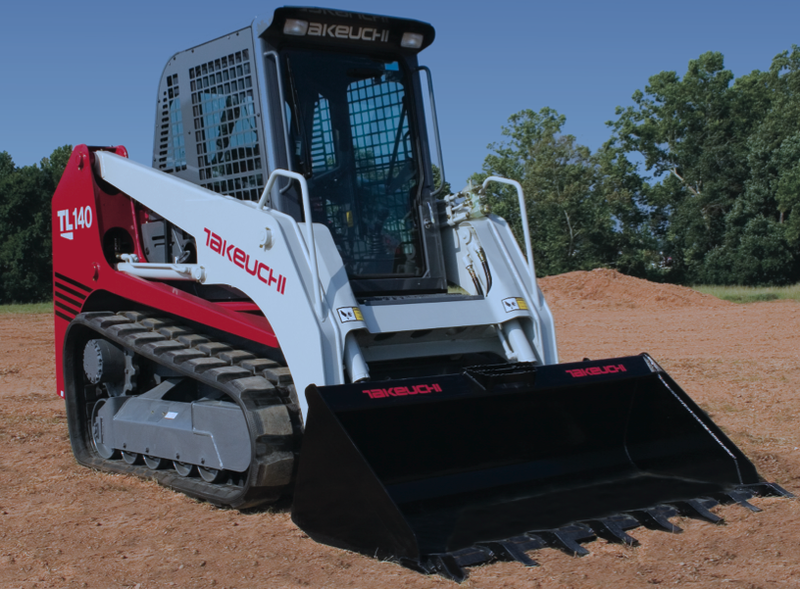 Skid Steer Loader Rental – Takeuchi TL140 With Tracks, is available for rent in Rochester NY, Ithaca NY and the entire Western New York region from the Duke Company. This powerful, rubber-tracked machine enables the operator to navigate a wide range of terrain with reduced ground pressure. Its turbocharged, diesel-powered engine generates 81 hourse power at 2,500 RPMs. It has an operating capacity of 2,083 pounds, tipping load of 5,952 pounds, operating weight of 9.769 pounds, and travel speed of 4.6 to 6.6 miles per hour. It is 146 inches long and 90.3 inches wide – with the standard bucket. Its reach at maximum height is 34.4 inches, and it has a front clearance radius of 90.3 inches (with bucket).